Running a Network Time Protocol (NTP) server in the pool.ntp.org project can incur $500/year in data transfer (bandwidth) costs. Those costs can be reduced or even eliminated by choosing alternative Infrastructure as a Service (IaaS) providers, modifying the server’s pool.ntp.org connection speed setting, choosing an alternative continent upon which to place the server, and modifying the NTP daemon’s configuration file to rate-limit the clients. We had dropped the ball — we had never concluded the series, had never written part 3, had never described the strategies to mitigate the data transfer costs. This blog post remedies that oversight; it consists of two parts: the first part addresses strategies to reduce the cost of running an NTP server, and the second part discusses side topics (aspects of running an NTP server). 2.2 Are Virtual Machines Adequate NTP Servers? Yes. Why Is My NTP Server Costing $500/Year? Part 1. We analyze our sudden increase in AWS data transfer charges and conclude that adding our server into the NTP pool is the sole reason for the data transfer increase. Why Is My NTP Server Costing Me $500/Year? Part 2: Characterizing the NTP Clients. We characterize the demand that each NTP client places on an NTP server, by operating system. To our surprise, FreeBSD and Ubuntu place the greatest demand on the NTP servers, and Windows and macOS the least. We maintain several servers in the pool.ntp.org project. These servers are personal, not corporate, so we’re quite sensitive to cost: we don’t want to spend a bundle if we don’t have to. Also, these servers have roles other than NTP servers (in fact, their primary purpose is to provide Domain Name System (DNS) service and one is also a Concourse continuous integration (CI) server). We have benefited greatly from the open source community, and providing this service is a modest way of giving back. Our day job is a developer on BOSH, a tool which, at its simplest, creates VMs in the cloud based on specifications passed to it in a file. We use BOSH to deploy our NTP servers, and on at least two occasions we have uncovered obscure bugs as a result. On the rare occasions when our systems fail, often our first warning is an email from the pool with the subject, “NTP Pool: Problems with your NTP service”. In other words, being in the pool is a great monitoring system, or, at the very least, better than nothing. We have two NTP servers in the pool.ntp.org project whose country is set to “United States” and whose connection speed is set to “1000 Mbit”. We have gathered the following statistics [NTP statistics] over a seven-day period (2017-01-21 15:00 UTC - 2017-01-28 15:00 UTC). Note that other than data transfer pricing, the choice of underlying IaaS is unimportant (assuming proper functioning of VM/disk/network). In other words, although the Google Compute Engine (GCE) server carries more traffic than the Amazon Web Services (AWS) server, the roles could have easily been reversed. The mechanism underlying pool.ntp.org project (a multi-stage mechanism which “targets the users to servers in/near their country and does a weighted round-robin just on those servers”), is not a perfectly precise balancing mechanism (e.g. some clients will “stick” to a server long after the pool.ntp.org record has updated). Although we present statistics for both inbound (NTP queries to our server) and outbound traffic (NTP responses from our server), it is the outbound traffic which is of particular interest to us, for the inbound traffic is usually free, and the outbound traffic is usually metered (both AWS and GCE charge for outbound traffic but not inbound). We have attempted to maintain a consistent coloring scheme for our charts, using blue for inbound (free) and green for outbound (metered). The mnemonic is that green, the color of US currency, is the metric for which we pay. We believe that the choice of IaaS is the most important factor in determining costs. For example, running an NTP server on GCE would have an annual cost of $945.36, and running a similar server on DigitalOcean would cost $120 — that represents an 87% reduction in total cost and an annual savings of $825.36. Our GCE configuration assumes a g1-small instance (1 shared CPU, 1.7 GiB) RAM ($0.019 per hour) running 24x7 (30% Sustained Use Discount) for a monthly cost of $13.80. We then add the monthly data transfer costs of $64.98 for a monthly total of $78.78, annual total of $945.36. The NTP server need not reside in an IaaS; it is equally effective in a residence. In fact, savvy home users who have a static IP, have set up an NTP server, and who are comfortable sharing their NTP service with the community at large are encouraged to join the pool. It is particularly important when setting up an NTP server in a residence to set an appropriate connection speed (see next section). 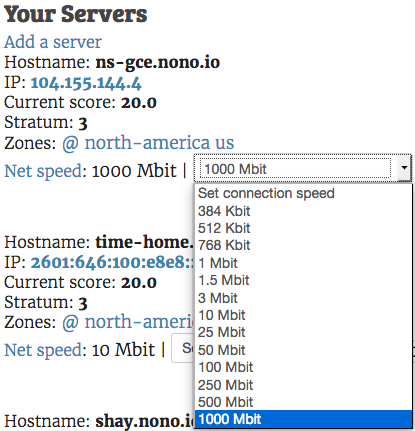 The most important tool to control the amount of traffic your NTP server receives is to use the “Net speed/connection speed” setting in the Manage Servers page. Its thirteen settings cover more than three orders of magnitude. Using our GCE NTP server as an example, at the highest setting (1000 Mbit), we incur $64.98/month, and at the lowest setting (384 Kbit), $0.02/month. The tool isn’t precise: as previously mentioned, round-robin DNS is a blunt instrument. We have two NTP servers based in the US whose connection speed is set to 1000Mbit, and yet their outbound traffic differs by 4% (our AWS server carries 4% less traffic than our GCE server). Using the connection speed will get you in the ballpark, but don’t expect precision. The net speed is used to balance the load between the pool servers. If your connection is asymmetric (like most DSL connections) you should use the lower speed. The million-dollar question: what is the fraction, exactly? about 2% worst-case scenario (i.e. server is placed in the United States). Assuming 90 bytes per NTP packet, 1,000,000,000 bits per Gbit, aggregating inbound and outbound (2Gbps total aggregate bandwidth per server), we calculate the bandwidth to be, on our 4 servers, 2.10%, 2.16%, 0.67%, and 0.35%. Our home connection is not metered, so we don’t incur bandwidth charges (i.e. it’s free). The pool.ntp.org project's menu option on the server management page allows you to throttle the traffic on your server. The lower your connection speed, the less traffic your server will receive, and the lower the bandwidth costs. The placement of the NTP server has dramatic effect on the bandwidth and cost. For example, our German NTP server’s typical outbound monthly traffic is 82.63 GiB, which is 85% less bandwidth than our US/Google server’s monthly 541.51 GiB. A note about placement: The pool.ntp.org project allows participants to place servers in various zones. A “zone” consists of a country and that country’s continent (there are non-geographic vendor zones as well, e.g. Ubuntu has a zone “ubuntu.pool.ntp.org”, but those zones fall outside the scope of this discussion). The pool will “will try finding the closest available servers” for NTP clients, which may or may not be in the same zone. We don’t have NTP servers on all continents (we’re missing Antarctica, Oceania, and South America), so we don’t have insight on the bandwidth requirements for NTP servers placed there; however, we do know that our server in Asia is not as stressed as our US/Google server (166.00 GiB vs. 541.51 Gib). We were curious why the load on our German server was so light, and we believe that part of the reason is that there is much greater participation in the pool.ntp.org project in Europe. Europe, with 2,686 servers, has almost exactly 3× North America’s meager 895 servers. The ntp.pool.org's servers, broken out by continent. We have found that by enabling NTP’s rate limiting feature can reduce the outbound traffic by 9.56% on average (as high as 16.60% for our German server and as low as 6.57% for our GCE server). But don’t be fooled into thinking that rate limiting’s sole purpose is to reduce traffic a measly 9%. 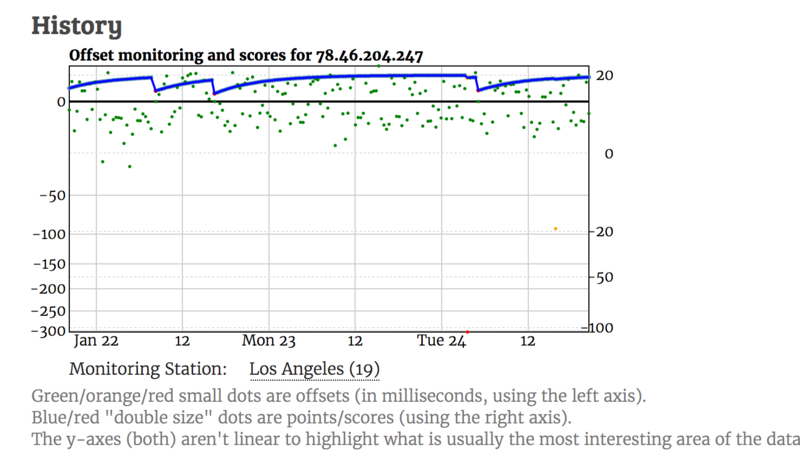 Rate limiting has an unintended side benefit: it throttles traffic during excessive NTP query events. For example, Snapchat released a broken iOS client which placed excessive load on NTP servers (see below for more information) in mid-December. Traffic to our AWS server, normally a steady 600 MiB / hour, spiked viciously. In one particular hour (12/18/2016 04:00 - 0500 UTC), the inbound traffic climbed almost ninefold to 4.97 GiB! Fortunately, rate limiting kicked in, and rejected 69.30% of the traffic, which reduced our cost for that hour by 69.30%, for we are charged only for outbound traffic. Rate limiting is enabled by adding the kod and limited directives in the NTP servers configuration file. In our servers’ configuration, we use the suggested restrictions for servers “who allow others to get the time” and “to see your server status information”. Links to our ntp.conf files can be found here. Disclaimer: we’re not 100% sure it was rate-limiting that clamped down on our outbound traffic. There is a small chance that it was another factor, e.g. ntpd was overwhelmed and dropped packets, AWS (or GCE) stepped in and limited outbound NTP traffic. We haven’t run the numbers. We encourage those with NTP servers with static IPs to join the pool; the experience has been personally rewarding and professionally enriching (how many can claim to operate a service with thousands of requests per second?). We also lay out a cautionary tale: when joining, keep an eye to costs, especially bandwidth. Opting for a lower connection speed initially (e.g. 10Mbps), and ratcheting it up over time is a prudent course of action. Google has announced public NTP servers. Over time, we suspect that this will reduce the load on the pool.ntp.org project’s servers. 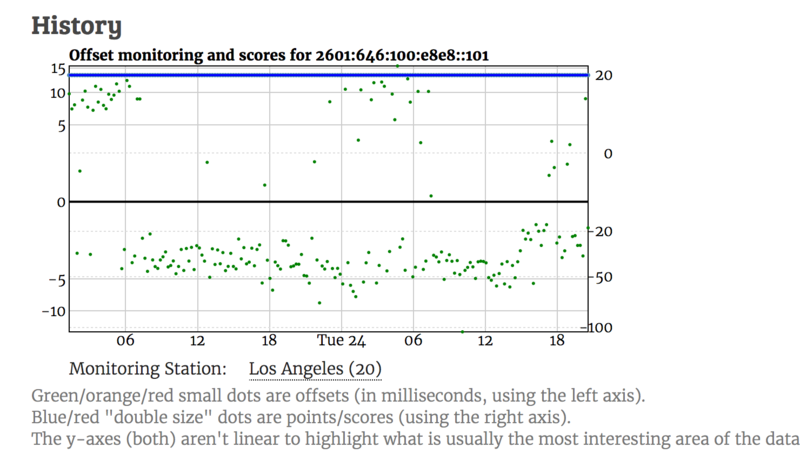 Servers in the NTP Pool should not use Google's NTP servers as upstream time providers, nor should they use any upstream provider which "smears" the leap second. The NTP pool supports the leap second, which is the UTC standard. The advantage of the leap second is that every second is always the same length, i.e. “9,192,631,770 periods of the radiation emitted by a caesium-133 atom in the transition between the two hyperfine levels of its ground state”. Google, on the other hand, smears the leap second, which lengthens the second by 13.9µs during the ten hours leading up to and following the leap seconds. Their reasoning is, “No commonly used operating system is able to handle a minute with 61 seconds”. For readers interested in using Google’s NTP service, the server is time.google.com. In December Snapchat released a version of its iOS app that placed undue stress on the pool.ntp.org servers. This event caused great consternation among the NTP server operators, and words such as “decimated”, “server loss”, and “sad” were used. Our AWS chart presents hourly inbound and outbound traffic, measured in MiB. Times are in UTC. Inbound traffic is fairly steady, averaging 611 MiB/hour, and so is outbound traffic, averaging 562 MiB/hr. There’s little difference between inbound and outbound traffic (i.e. ntpd’s rate-limiting is kicking in at a modest ~8%). The onset of the event was sudden: on 12/13/2016, inbound traffic jumped from 12.7 GiB the previous day to 18.2 GiB. There were unexplained dips in traffic during the event. For example, on 12/16/2016 0:00 - 3:00 UTC, the inbound traffic fell below 300 MiB/hr. Not only was this extremely low in the midst of an NTP excessive query-event, but it would have been abnormally low during regular service. The event had a long tail. Even though Snapchat released a fix, traffic hadn’t normalized by the end of December. Things had improved, but they hadn’t gotten gotten back to normal. Our GCE chart presents per second inbound and outbound traffic, measured in packets. Times are in EST. Unlike AWS, there were no unexplained dips in traffic. Google smoothed the graph — it’s not as jagged as AWS’s. Similar to AWS, the traffic is steady leading up to the event. The traffic during the event can clearly be seen to follow a daily rhythm. The peak-to-baseline ratio matches that of the AWS graph (baseline of 3.1 kpackets/sec, peak of 25kpackets/sec, shows an 8.3× increase; AWS’s was 9×). Rate-limiting clamped down on the most egregious traffic, containing costs. We stretched the timescale: we went as far back as 2016-11-01 and as far forward as mid-January, 2017. We examined traffic daily, not hourly, to reduce the spikiness. It was easy to mark the beginning of the event (2016-12-13): it came in with a bang. It was difficult to mark the ending of the event: it went out with a whimper. There was no sudden cliff as traffic fell, rather, it was a slow dwindling of traffic. We chose, for better or worse, to delineate the end of the event by marking a local minimum of traffic (2017-01-12). 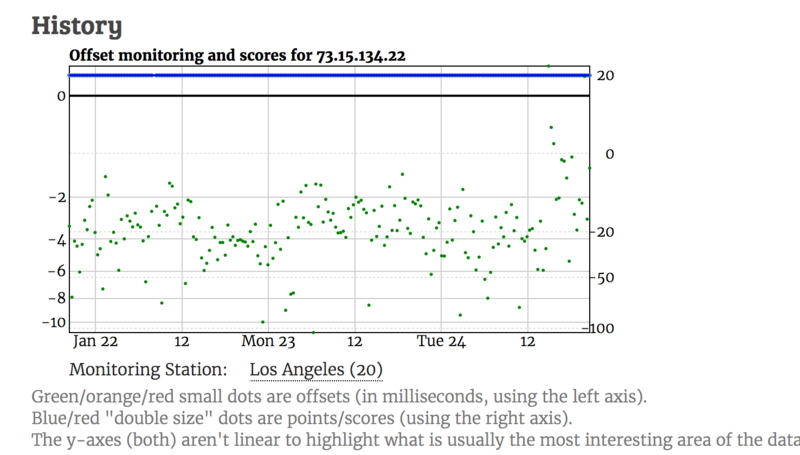 Note that traffic remained significantly above the baseline after that point. How much did the NTP event cost us? By our reckoning, the event lasted 30 days, and the average amount of daily traffic above the baseline was 4.97 GiB, for a total of 149.1 GiB. Given that AWS charges $0.09 per GiB, the total cost of the Snapchat event for our AWS server was $13.42. We can extrapolate for our GCE server: the amount of traffic would be similar, but Google’s bandwidth is 33% more expensive ($0.12 vs. AWS’s $0.09), giving us an estimate of $17.90. There were no additional costs for our German server (we did not exceed the bundled bandwidth). Are Virtual Machines adequate NTP servers? The short answer is, “yes”, but the long answer is more complex. First, timekeeping within a VM is complicated (see the excellent VMware Paper for a thorough analysis): there are two ways that a computer (VM) measures the passage of time (tick counting & tickless timekeeping). Tick counting can result in “lost ticks”, which means the clock loses time (it slows down compared to true time), and tickless timekeeping, which, although eliminates the “lost ticks” problem, brings its own set of baggage with it (e.g. the hypervisor must know or be notified that the VM is using tickless timekeeping). Disclaimer: we cherry-picked our best NTP server; our other servers aren’t as accurate. Our Hetzner server, via IPv6, is typically +4ms/-4ms, and via IPv4 is typically +10ms/-10ms, our AWS server +20ms/-20ms, and so is our Microsoft Azure server. If you need consistently high CPU performance for applications such as video encoding, high volume websites or HPC applications, we recommend you [don’t use Burstable Performance Instance]. We also find that the network plays a role in the accuracy of the NTP servers. We suspect that is one of the reasons that our Microsoft Azure VM, which is located across the globe (from the Los Angeles-based monitoring station) in Singapore, has among the least accurate metrics. Which leads into our next topic. We were convinced that the network was often a bigger factor than virtualization in NTP latency, but how to prove it? If only we were able to have two exactly identical NTP servers on different networks and measure differences in latency. But how to accomplish that? That’s right: one of our NTP servers (shay.nono.io) was dual-stack: it had both IPv4 and IPv6 addresses on its single ethernet interface, which eliminated differences in IaaSes, operating systems, RAM, cores, etc… as factors in latency. The IPv6 stack never dropped a packet; The IPv4 stack dropped a 4 packets over the course of three days. The IPv6 stack is tightly concentrated in the +3/-4ms range; the IPv4 stack, on the other hand, sprawls across the +20/-20ms range. 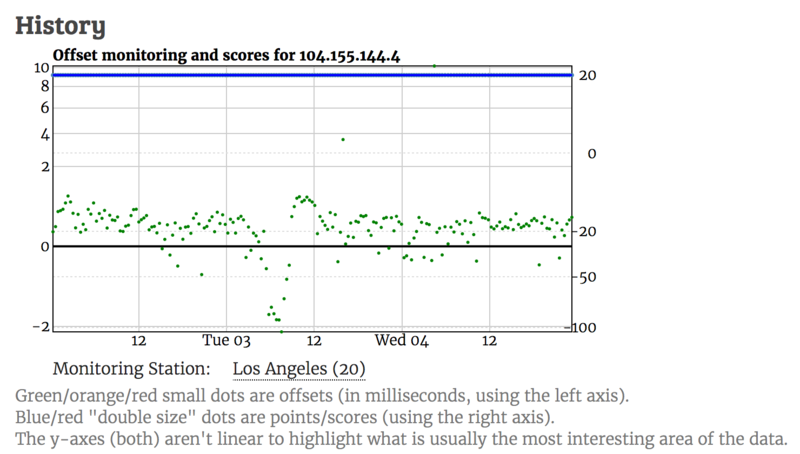 The IPv4 stack is concentrated on the -2/-10ms range (8 millisecond spread); the IPv6 traffic has spread that’s twice as wide, +10/-5ms (15 millisecond spread). Although this server is not as an extreme example of latency differences as the previous one, it supports our contention that the network can have a powerful effect on latency. Our costs increased 50% for a simple reason: the amount of NTP traffic increased. When we wrote the original blog post in two and a half years ago in June 2014, our monthly outbound traffic was 332 GiB; in January 2017 it had climbed to 542 GiB (for our GCE NTP server, 520 GiB for our AWS NTP server). The public cloud IaaS market grew 51% in 2015. IDC expects this high growth to continue through 2016 and 2017 with a CAGR of more than 41%. We needed more data. We turned to Amazon’s Usage Reports. We downloaded the report and imported it into a spreadsheet (Google Sheets). These numbers are necessary but not sufficient: we want to know, “how much will my data transfer cost each month?” [AWS data transfer cost] To determine that, we’ll need to know Amazon data transfer pricing, our inbound and especially outbound traffic, and the size of NTP packets in bytes. The average number of days per month in the Gregorian calendar is 365.2425 / 12 = 30.436875. It would be irresponsible for a post about NTP to casually peg the number of days in a month to 30. Respect time. The raw data from which the numbers in this blog post are derived can be found in a spreadsheet. The organization is haphazard. The data contained therein is released into the public domain. AWS charges $0.09 per GiB for Data Transfer (bandwidth) OUT from Amazon EC2 us-east-1 (Virginia) region to Internet. Inbound data transfer is free. In spite of these qualifiers, we feel the $0.09/GiB is an appropriate value to use in our calculations. AWS measures their data transfer pricing in terms of GiB (230) instead of GB (109) (although their documentation refer to the units as “GB”). Google charges $0.12 per GiB for Data Transfer (bandwidth) OUT from Google Cloud Platform. We find Google’s pricing to be simpler than Amazon’s — Google’s pricing is uniform across Google’s datacenters, whereas Amazon’s data transfer costs can vary by region (datacenter). We do not have a pricing scheme set up yet for bandwidth. As such, we do not actually charge for it. Our engineering team is working on a solution for this, but it has not been given an ETA. We often suggest customers who are heavy BW utilizes to just be kind to our platform & be mindful when we reach out with requests to slow down just a bit, as times, it can become disruptive to customers downstream. Some may be tempted, knowing that the bandwidth is not measured, to opt for the lower-tier $5/month server (with 1TB bandwidth) to provide an NTP server to the community. We find such a decision to be on ethically shaky ground, for we know that our bandwidth would most likely exceed that amount (we estimate 1.1 - 1.4 TiB aggregate inbound and outbound), and we’d be taking advantage of DigitalOcean’s momentary bandwidth blind spot. As such, any benefits we would provide to the community would be, in a sense, fruit of a poisonous tree. IPv4 NTP packets are 76 octets (bytes) (IPv6 NTP packets are 96 octets, but we ignore the IPv6 packet size for the purposes of our calculations — the two servers (AWS & Google) from which we gather statistics are IPv4-only). We calculate the size as follows: we know the size of an NTP packet is almost always 48 bytes (it can be longer; the NTP RFC allows for for extension fields, key identifiers, and digests in the packet, but in practice we rarely see those fields populated). The NTP packet is encapsulated in a User Datagram Protocol (UDP) packet, which adds 8 octets to the length of the packet, bringing the total length to 56. The UDP packet in turn is encapsulated in an IP (IPv4 or IPv6) packet. IPv4 adds 20 octets to the length of the packet, bringing the total to 76. IPv6 adds 40 octets to the length, for a total of 96. The IP packet in turn is encapsulated in an Ethernet II packet. The Ethernet II header does not include the 7-octet Preamble, the 1-octet Start of frame delimiter, the optional 802.1Q tag (we’re not using VLAN-tagging), nor the 4-octet Frame check sequence. It does include the 6-octet MAC destination and the 6-octet source, as well as the 2-octet ethertype field, which adds 14 octets to the length, for a grand total packet size of 90 bytes for IPv4 and 110 bytes for IPv6. To confirm our calculations, we turn to tcpdump, a popular network sniffer (a tools which listens, filters, and decodes network traffic). We use it to expose the lengths of an IPv4 NTP packet. -e capture the Ethernet frame, needed for Ethernet II length. We are confident that AWS charges only for the IP-portion of network packets and not the Ethernet portion, but we were unable to find this explicitly in writing. We deduced it by running the following test. The number of inbound packets received during the hour was 9,961,945. Now that we know the number of packets, we need to find out the number of bytes. And then it’s simple math: we divide the number of bytes by the number of packets. If the number is close to 90, then AWS is measuring the Ethernet frame, 76, the IP frame. We expect the number of inbound bytes to be approximately 757,107,820 (76 × 9,961,945). Calamity has struck! The number of inbound bytes from 05:00-06:00 is 657,882,293 is much too small. Not even close. Not even possible. The absolute minimum number of bytes is 757,107,820 (that’s the number of NTP packets × the minimum NTP packet size, 76 bytes). It’s possible to have more traffic (e.g. larger NTP packets, non-NTP traffic (ssh, DNS)), but not less. With the numbers we have, there are ~66 bytes per packet, and we need to get to 76 bytes per packet. Maybe the report is in a different time zone? No, we know that “All usage reports for AWS services are in GMT”. Here is an interesting tidbit: 10% of the inbound NTP traffic originates from within the Amazon cloud. The NTP server’s statistics are collected every five minutes, and are thus a line. 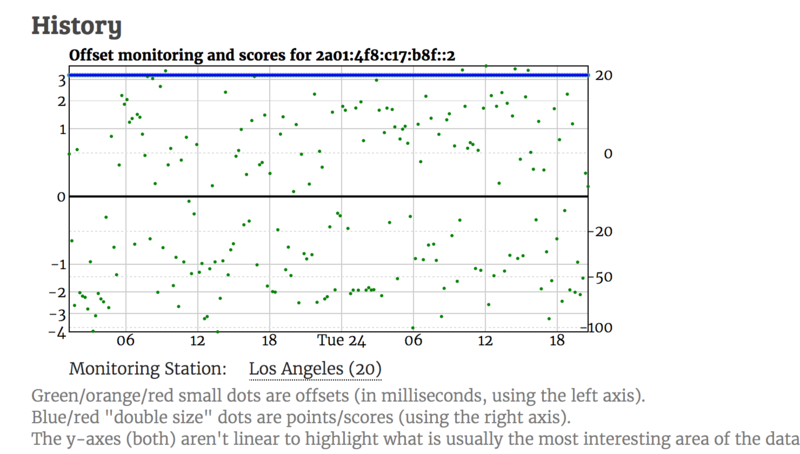 The AWS data transfer statistics are coarser, only by the hour, and show up as purple dots. It’s evident that the two correlate, within a few percentage points. We expected the AWS’s numbers to exceed ours by a slight amount, for our numbers collected via ntpq only report the NTP traffic, and we know that our server carries other traffic as well (it’s a DNS server, too); however, we found the opposite to be true: the traffic reported by AWS was consistently smaller than our NTP traffic, albeit by a small amount. We are not sure why, and are presenting this as a mystery. We uploaded the file into Google Sheets, calculate the delta between the five minute intervals, created a rolling hourly sum, and compared it with the output of the AWS usage report. We are confident that Google charges only for the IP-portion of network packets and not the Ethernet portion, but we were unable to find this explicitly in writing. Instead, we inferred this via the manner in which Google measures packet size, and were so pleased with our methodology that we would like to share it. Having both numbers allowed us to calculate the number of bytes per packet. If the number was close to 90 bytes per packet, then Google was including the Ethernet/data link layer. If the number was close to 76 bytes per packet, then Google was only counting the IPv4 portion of the packet. Our numbers? 76.19 and 76.06, within 0.25% of 76 bytes. Our conclusion? Google is only counting the IPv4 portion of the packet. (You may ask why we are not concerned that the average number of bytes per packet is not exactly 76 bytes. The answer? The servers carry traffic other than NTP (e.g. the Google server is both a DNS server and a Concourse continuous integration (CI) server, which often have packet sizes other than 76 bytes. Also, a small portion of NTP packets are greater than 76 bytes). A quote on the mechanism that pool.ntp.org uses to select servers was missing the phrase, “just on those”. The quote has been corrected. The calculation for cost of aggregate data transfer for the entire US pool.ntp.org did not take into account tiered pricing. Pricing was adjusted: original cost was $5,640, adjusted cost is $4,078. Phrasing was changed to improved readability. We removed a comment that pointed out we had not gathered statistics for our Azure NTP server; it seemed pointless. The post mis-characterized the mechanism behind the NTP pool as “round-robin DNS”; the mechanism is more sophisticated: It targets the users to servers in/near their country and does a weighted round-robin just on those servers. The system is a little more sophisticated than just round-robin DNS. It targets the users to servers in/near their country and does a weighted round-robin just on those servers. We have added sections describing our motives for operating NTP servers and encouraging others to join the pool. Thanks Leo Bodnar. We wrongly encouraged NTP pool servers to use Google’s NTP servers as upstream providers. We now warn against using Google’s NTP servers, and provide reasons why (leap seconds). Thanks Joseph B, Ask. We added statistics regarding the aggregate netspeed for the US zone.